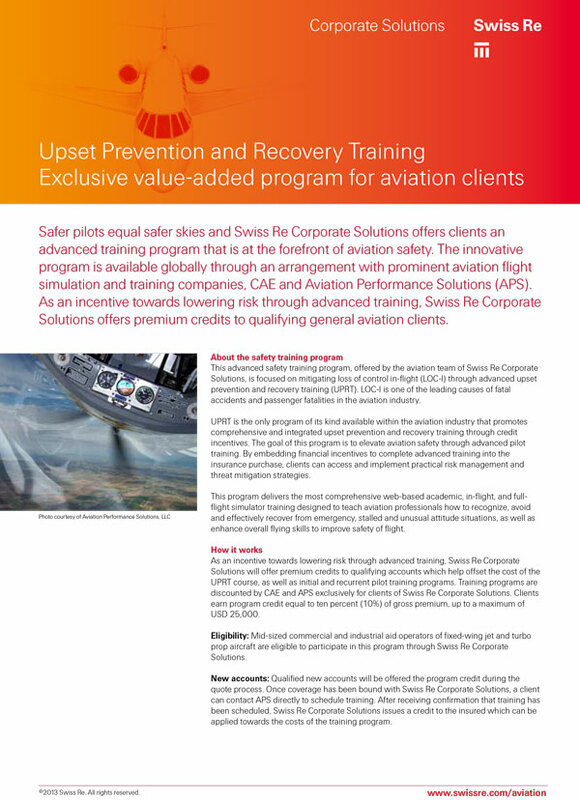 Swiss Re Corporate Solutions is currently offering their clients premium credits (up to $25,000) to participate in Upset Prevention & Recovery Training (UPRT) through APS and partner flight simulation company CAE. This advanced training program lowers risk through mitigating aviation’s number one threat to safety, Loss of Control In-flight (LOC-I), and provides many additional benefits to pilots and flight departments. Loss of Control In-flight is the leading cause of fatalities across all sectors of aviation. Upset Prevention & Recovery Training (UPRT) mitigates the risk of LOC-I through integrated ground, on-aircraft and simulator training that teaches pilots the skills necessary to recognize, prevent and if necessary, recover from an unexpected airplane upset. Because pilots do not practice the manual inputs necessary to recover an upset aircraft during general pilot training (in fact, outside the normal flight envelop, the correct manual inputs are often exactly the opposite of pilots’ instinctual and learned responses), on-aircraft UPRT is essential for pilots to gain the skills necessary to prevent or recover from a loss of control in flight. APS is an IS-BAO registered, FAA Part 141 approved flight school with a curriculum applying systematic, building-block methodologies aligned with the latest ICAO, IATA and FAA guidance and best practices in URPT. APS training is in full compliance with the ICAO Manual on Aeroplane Upset Prevention & Recovery Training and the Airplane Upset Recovery Training Aid – the industry’s accepted global standard, and APS UPRT goes above and beyond those standards in the areas of safety management and pilot qualification. Academics provide a background understanding of aerodynamic principles both within and beyond the normal flight envelope and develop an awareness of the proper prioritization, methods and techniques applied in an escalating or fully developed airplane upset event. 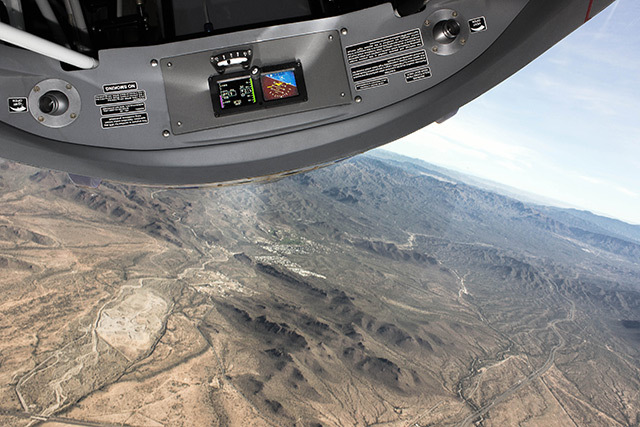 On-aircraft training is used to bring academic concepts to life, illustrate aerodynamic characteristics and behavior not fully modeled in most of today’s simulators, and to provide the essential human factors training essential to defeat a time-critical, life threatening airplane upset. 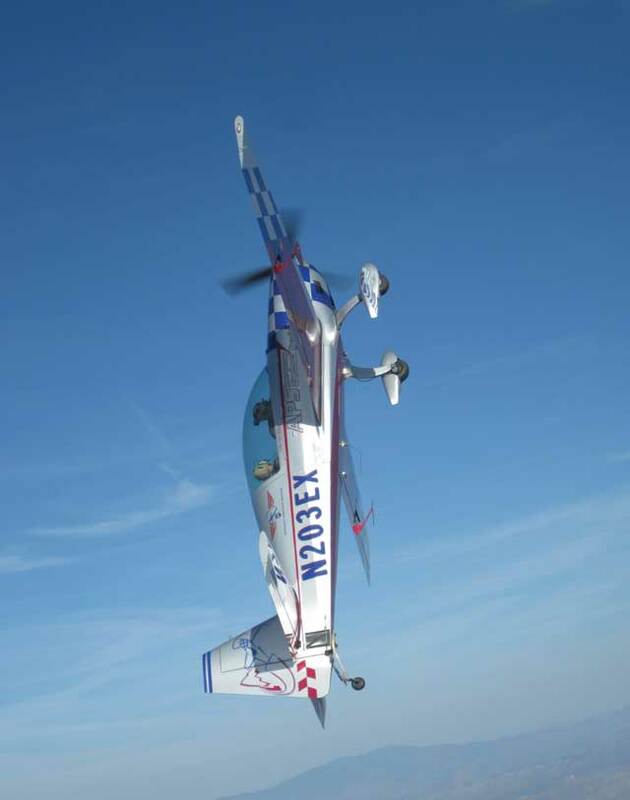 In addition, APS UPRT provides enough flights and missions to allow for the repetition necessary to ingrain UPRT skills with the goal that they will become second nature to pilots in the event of an unexpected loss of control in flight. APS offers the opportunity for policyholders to upgrade UPRT programs by adding additional training enhancements. All travel, lodging and other logistical costs are the responsibility of the policyholder. Swiss Re Corporate Solutions will offer premium credits to qualifying accounts which help offset the cost of the UPRT course, including both initial and recurrent pilot training programs. Training programs are also discounted by CAE and APS exclusively for clients of Swiss Re Corporate Solutions. Clients earn program credit equal to ten percent (10%) of gross premium, up to a maximum of USD 25,000. Eligibility: Mid-sized commercial and industrial aid operators of fixed-wing jet and turbo prop aircraft are eligible to participate in this program through Swiss Re Corporate Solutions. Qualified new accounts as well as renewing accounts will also be offered the program credit. After receiving confirmation that training has been scheduled, Swiss Re Corporate Solutions issues a credit to the insured which can be applied towards the costs of the training program.